Have you ever been so absorbed by the cover art of a record, cassette, CD, or even digital download, that it comes to represent the music you adore? You have Alex Steinweiss to thank for that. He is the inventor of the modern album cover, initiating vinyl cover design in the early 1940s. Before Steinweiss, music came in simple and uninspiring plain packaging. But after he was appointed as the first Art Director of Columbia Records, Steinweiss began experimenting with music cover design and the larger concept of ‘cover art’ in general. Steinweiss studied at Parsons School of Design and from an early age was destined to become a commercial artist. After Columbia developed long-playing records, Steinweiss was asked to create a packaging solution that would cater to the new product. While he didn’t invent the inner sleeve, his folded-over board format soon became the industry standard. As well as the construction of the LP cover, Steinweiss revolutionized the look of popular records. 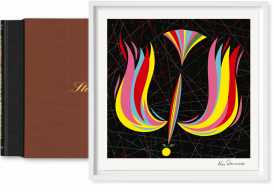 He brought together his skills in illustration and typography, creating a signature graphic art form comprised of flat color, abstract forms, logos and what became known as the Steinweiss Scrawl - a curly, hand-drawn calligraphy. A golden age of album cover design began, with Steinweiss at the helm. He went on to design record covers for many popular music labels, including Decca, London, Remington, and Everest. 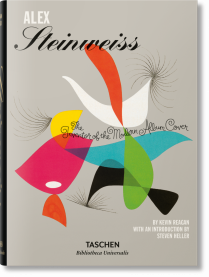 TASCHEN has collated many of his artworks together in a focused monograph on the designer and his work also features in the book 1000 Record Covers. 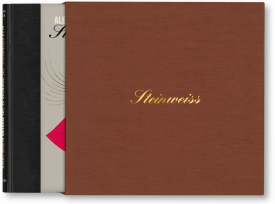 Responsible for the concept of the cover, Steinweiss’ mini canvases translate aural experience into visual pleasure.